I created a diagram with the yed graph editor, which you can all get from here (free), in case you wish to do the same or play around with the file which I created, which you can download from here. Included in the package is also the photoshop file where I added the text. It helps me to visualize this stuff, but I may not have gotten the structure right. So, I am calling this one version 1. I am thinking that we may need to have a controller avatar (node 01) who receives the input in-world from other authorized contributors (nodes 03) as private Instant Messages and transmits the stuff to the server where it can become aggregated with that non SL input. Does that make sense? Or do authorized SL folk type their text in open chat, the controller avatar recognizes them from their names, knows that they are authorized persons and transmits the input to the server that way? Selavy:: I’m including my response again directly here in the post. Node 01 would not be just one bot, but several bots. They could assume the different roles, which Roy suggested in one of his mails, and they would also wear the attachments (the text objects in the current graph). The bots would indeed act as receivers, but at the same time would show the current state of the text on their attachments. I thought that the communication would be via IMs, because when using text chat authorized avatars (nodes 03) could not talk via chat in the vicinity of the bot nodes without the text being sent to the server. The server would thus receive inputs from different nodes, and the type 01 nodes would be more than just a single one, just like type 02 nodes. Authorized contributors could choose one bot, or send IMs to different bots, just as they like. The server simply concatenates the texts in the order of reception, and provides the concatenated text for the text objects in SL, but also (and that’s currently missing) to a web page that can be accessed outside, because otherwise the contributors operating real-life type 02 nodes won’t be able to see the text. The problem (or the advantage) with the whole concept is that the text is not editable by the contributors once it is sent out. Just like in a conversation where you can’t undo your last sentence. An alternative would be to use something like Google Docs (we talked about that in earlier mails) or TitanPad (just suggested by Pye). I am assuming that all the text (SL + RL) needs to come back into SL in the order that it was put into the server so that Roy’s concept comes to life. So, as an example, if at 19.42 someone in RL puts in a text and then someone in SL puts a text at 19.45 and then someone in RL at 19.50, we have a time sequence which is distributed over SL and RL. I would think that the server would need to send this input in the time order in which it was put in. Thus, it may make sense to have a separate avatar who will simply be the “address” which is used to send text to. 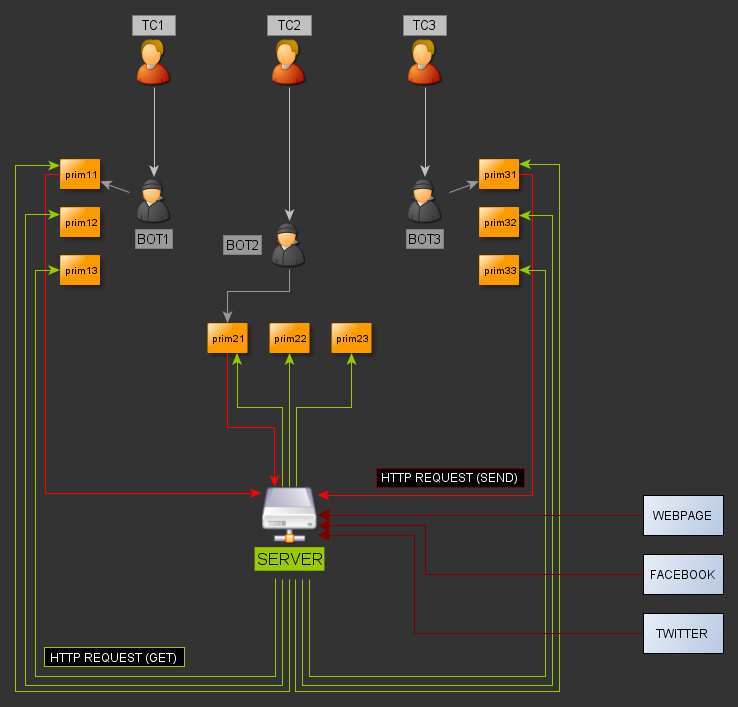 Once the server sends the sequentially compiled feed (SL + RL) back into SL – then the bots would start to play! Selavy: here is another one (completely done with the yed graph editor), and i tried to emphasize that the text contributors are outside of second life, but use avatars to provide their input. the dashed lines are the visual input from the computer screen to the text contributors, either via second life or via the web page. Right now I am trying to make the server up and running, then Selavy will connect SL to Database. In the meantime I will search the possibilities for connection with twitter and facebook. « How will the bots behave? i don’t see the need for a master of ceremony. if you’re afraid that text might not arrive in the correct sequence, that’s not a problem, we can easily send time stamps and author names with the text, so that the server could sort everything. in fact, the server is the master of ceremony, why have a second one? 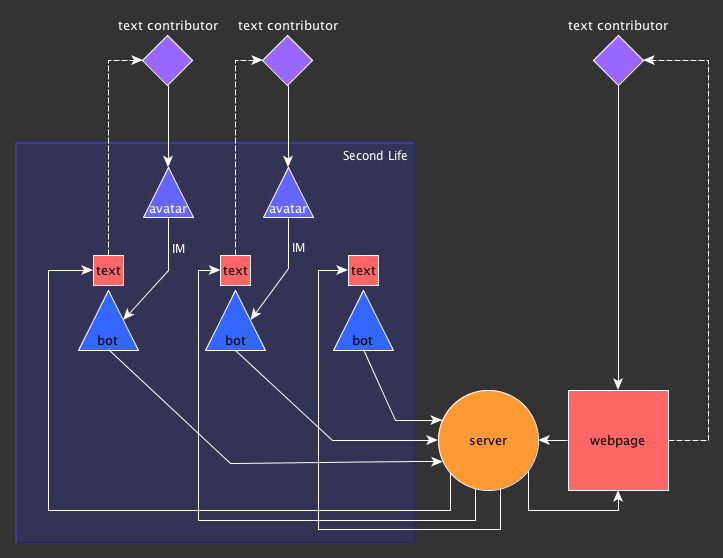 hope i’ll find some time to draw yet another version of the structure emphasizing the feedback loop from the server via the bot attachments and the human-controlled avatars back to the bots and to the server. This is just me thinking as a graphic designer really, nothing more. I found it much harder to draw chart 2 than I did chart 3 and so for some reason I assume that setting up a server connection as in chart 3 would be easier to configure. But, I am totally talking through my hat here – I really have no idea whatsoever. If it is the same thing in terms of setting up the server your version sounds good to me as well. But, this aside – I am thinking that you do need to tell us a bit more about what the bots will do? As I was asking you in the previous post? Or rather, as Emrah asked you before? The ones at BIW were reciting poetry, changing gender and wandering around. So, what will the LPDT2 bots be getting up to? Outside of transmitting text, that is? yep, we have to deceide what they should do. i’ll respond to that post, i simply didn’t have time so far. 1) Will the text contributors (RL+SL) be able to choose on which bot the text will be attached or will it be random? 4) either way we must think of some technical issue, beside sending string to the server, LSL must send the last ID of word that it is displaying. So that the server will know from which point it will send back the new words. Otherwise every time a POST event triggered the server will send back every word which will cause a huge amount of traffic after a point. What I mean is if BOT 1 is displaying the words from 1 to 5100, and new text is sent to be displayed, it should inform the server that it is already displaying the words up to 5100 and he/she wants to get only the new words. Let’s say the new text input consists of 100 words, then the server will only send the last 100 words not the whole 5200 words again. Onto matters of practicality: I will be traveling and afk until Thursday morning. Only very basic email checking once a day. Meanwhile, Seçkin: My blog is hosted with https://www.bluehost.com/. Can you go there and check out whether we can create a server there? Or do we need a new place? I will send you my log in info via email so that you can go “backstage” if you need to as well. If we can do this there, I see no reason why we shouldn’t. If not, then let me know ASAP so that I can discuss it with Roy when I see him next week. And you should continue to communicate with Selavy on all of this if you get stuck with something. While Selavy may not know how to set up an html server, when it comes to how thing work in SL I cannot think of a better person to consult with. Certainly far better than me: I know the place obviously, but I have no idea as to how the underlying code works and how it may relate to what you will be doing with the server. ok, i guess sending the IM as string via the POST method should work, even though i have to admit that the HTTP server methods are still a bit of a mystery to me. but that’s part of the fun here: i’m learning something new! question: why would you want to send individual words? why not sentences? answers: 1) as far as i understand, there’s one text after fusing (pleating) it, and that will be displayed on all the bots. but the text contributors can choose to which bot they will send their contribution. 2)+3) i think that there’s one text, and why would that be sent randomly? am i missing something here? 4) the text objects in SL can only hold a very limited amount of text, let’s say the last 100 words or so. but we can plan on having LSL send an ID with the query, that shouldn’t be a problem. but how is a prim in SL asking the server to get the new text? is that also via POST? sorry, but as i said, i’m still a bit lost with the server stuff. why isn’t the server simply generating a web page, which can be shown by media-on-prim (basically like in a browser window)?